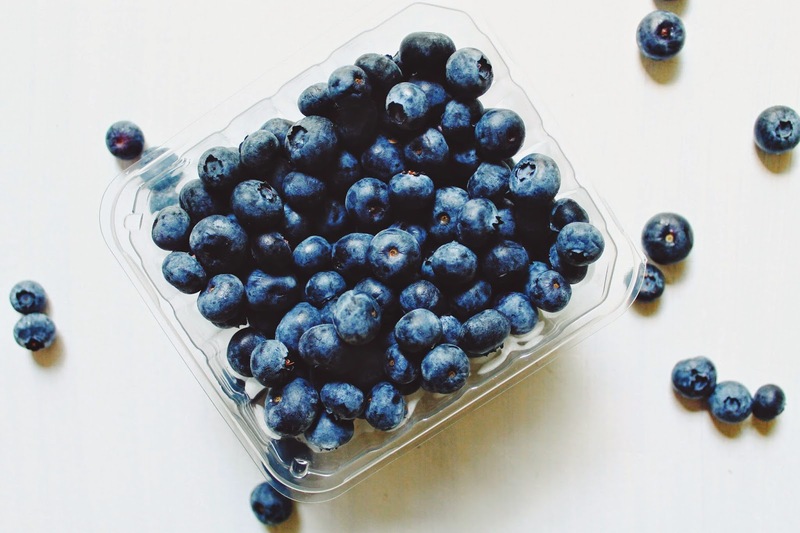 Our farmers' market is pretty much giving away blueberries. Last week, I popped by to pick up some greens for dinner and happened upon the deal of the summer: six pints of locally grown berries for three bucks. Naturally, I bought twelve. The problem, however, was not that I bought a dozen pints of fresh berries. The problem was that I foolishly did so just one day before we headed out of town. Okay, so we weren't exactly out of town. Rather, we headed out early Friday morning to pack up all our food and equipment at the shop and then zipped it over to Randall's Island, where we were scheduled to serve as food vendors at Phish's three-day show. I've fallen in love a bit with both Governor's and Randall's Islands this summer -- two tiny specks of land that float just off the coast of Manhattan. Although they're both just a five-minute ferry ride from the city (and are still technically a part of the city), they feel like a reprieve. There is a ton of green space (almost all green space, come to think of it), sweeping views of the East River and the city's skyline just across the water, and perhaps the best part: with the exception of food vendors and emergency vehicles, cars are not permitted on either island. Umm…bliss. The concert itself felt like such a treat. In college, I was a pretty serious Phish fan. Throughout the school year I'd save all my money from my work study gig so that in the summer I could pack up my Jeep with friends and tents and cases of beer and hit the road to go watch them play up and down the East coast. It was such a carefree time. None of us were worried yet about careers or paying bills or starting families or any of that grown-up stuff that bogs us all down today. The only thing we cared about was getting drunk and listening to music and falling asleep under the stars next to cute tie-dye clad boys. On Friday morning, after our crew set up our pop-up booth, I had an opportunity to hang out in front of the stage and listen to Phish warm up during their soundcheck. It felt like a private show. As a stood alone, listening to all the familiar chords, it brought back so many memories and made me feel (just for an instant) like I was that free and easy twenty-one year old girl again for a brief sliver of time. When I returned to our booth, all smiles and nostalgia, Jay just kind of shook his head and then reminded me that I was no longer "on tour" with the band. There was work to be done, he reminded me, and then handed me a box of bread and a knife. Each night of the weekend, as Phish took the stage and our line of customers slowed down until after the show, Jay and I lingered just outside of our booth to listen to the band play and to engage in a little harmless people watching. There was a lot of inebriated dancing, to say the least. It was funny to watch all those college kids in their teensy belly shirts and their flower crowns moving and shaking and smiling and drinking like it was the very best night of their lives. Who knows? Maybe for some of them, it was. For us, it was just another night of work (but with a much better musical backdrop). On Friday and Saturday, we were all sort of revved up by the energy of the band and the crowd. But after three days of waking up early and heading back to the shop to clean up until very late at night, by Sunday I felt completely wiped. During Phish's second set, I was sort of over my own nostalgia and was instead starting to get annoyed by the humidity and the constant smell of cigarettes and the gross port-a-potty situation and the slew of drunk kids who kept returning to our booth to beg for free food. While Jay and our staff started to clean up, I snuck off to a quiet, secure spot behind the booth, situated myself on a large rock at the water's edge and cracked open a beer. Nearby, a few other food vendors huddled on the rocks to sneak a joint, but I didn't mind. I had a clear view of the illuminated NYC skyline and the gentle currents of the East River that lapped against the shore. It was my own private space to sit and sip my beer and quietly listen while Phish performed their final song. While I still love Phish's music, I'm no longer that carefree girl I was way back when. After all, we still had a long night of work ahead of us back at the shop after the show. Monday morning, I returned home to discover a dozen pints of on-the-way out blueberries. Pretty poor planning on my part, but I had only myself to blame. Some of the berries were whipped into muffin batter. Some made their way into a summery crisp. About a pints-worth was eaten fresh while I mopped the kitchen floor. As for the rest of them? 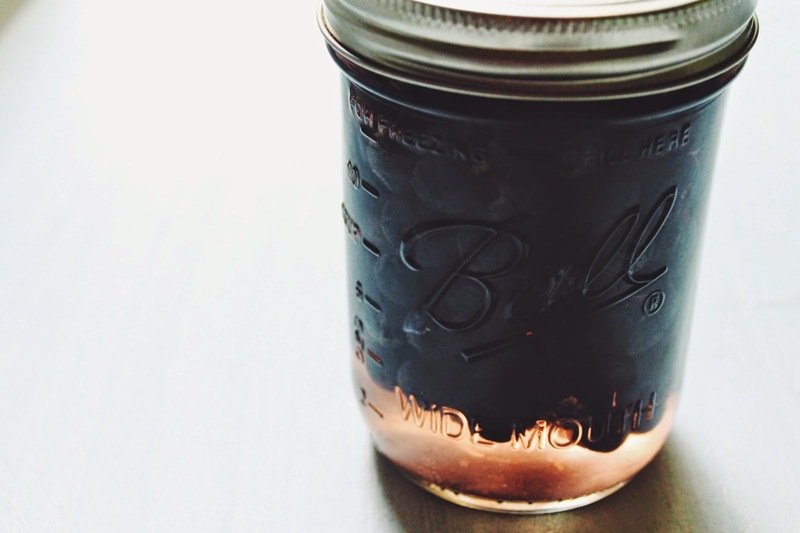 Well, they found their final fate inside a Mason jar. 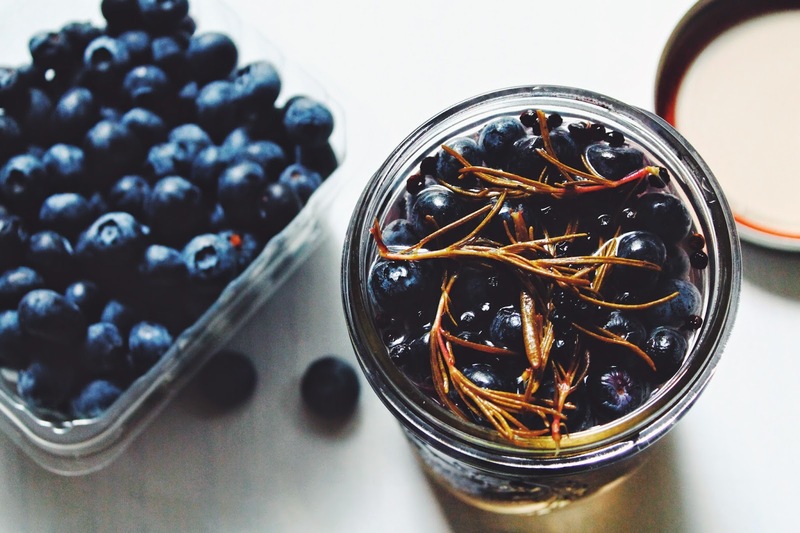 The rosemary-infused brine for these quick-pickled blueberries is as easy as, well (wait for it), pie. You should note that the recipe calls for a fair amount of sugar. 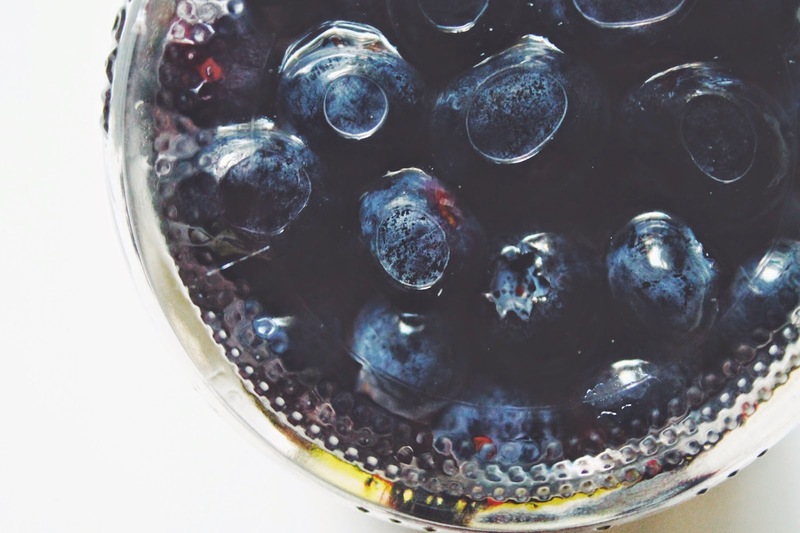 However, if your berries are particularly sweet, you can certainly scale the sugar back to your liking. 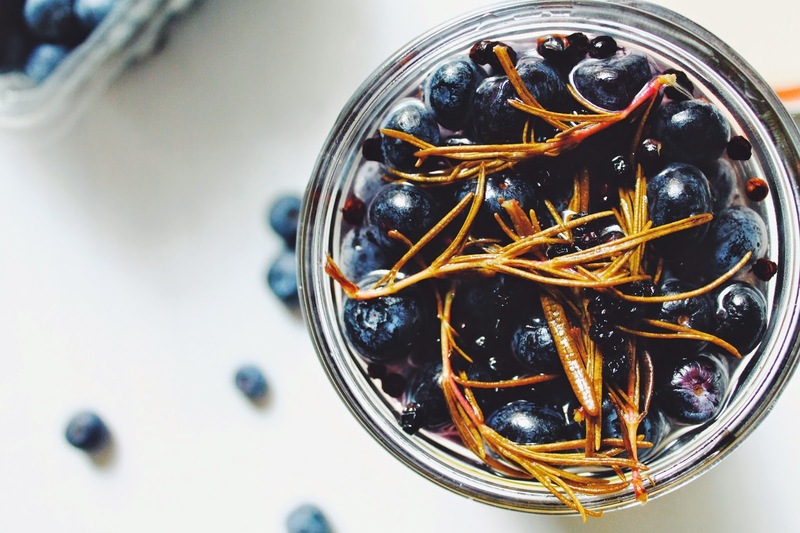 The final result is a jar full of very sweet, pleasantly tart, plump little berries, which you can enjoy on salads, serve alongside cheese spreads, scoop onto some seasonal crostini or use as a substitute for fresh berries in your favorite summer desserts. Enjoy, friends. Add the vinegar, sugar, salt, peppercorns and rosemary to a small saucepan and bring to a boil. 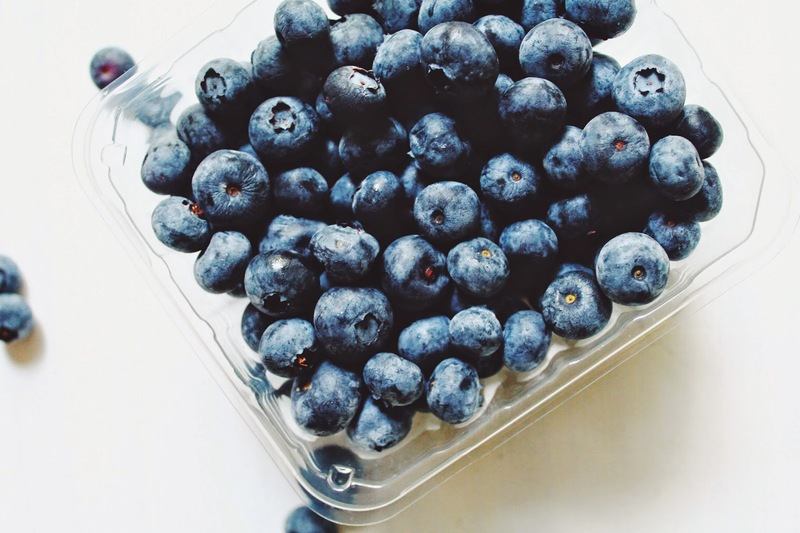 Meanwhile, rinse the blueberries and add them to a clean glass jar. Remove the saucepan from the heat and allow to slightly cool, about five minutes. 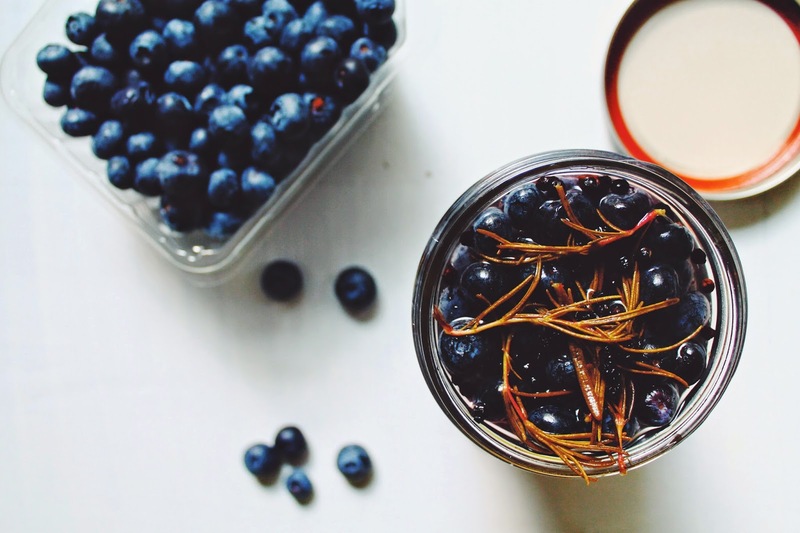 Pour the brine over the blueberries, being sure to cover the fruit entirely. Allow to cool to room temperature. 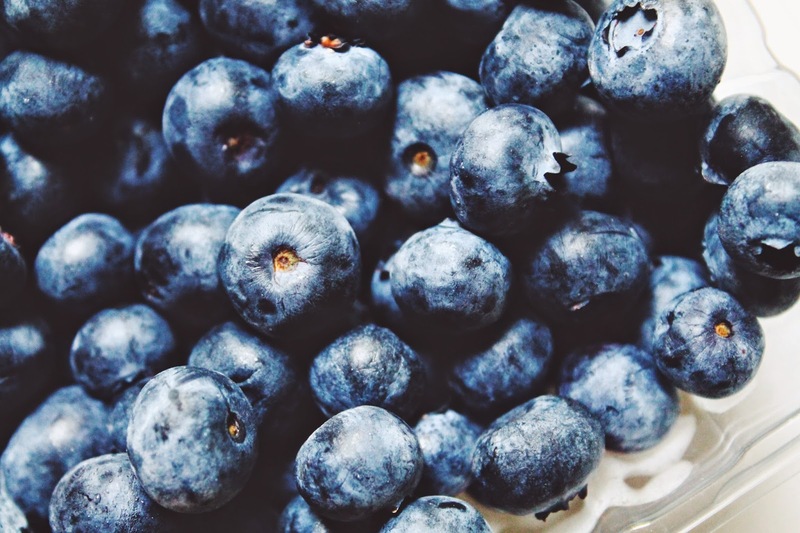 When kept covered and stored in the refrigerator, the blueberries will keep will for about 1 week. i never would have thought to pickle blueberries before.. definitely something i need to give a go, yum! Thanks Thalia! I never pickled my berries until last summer and now I am completely hooked! 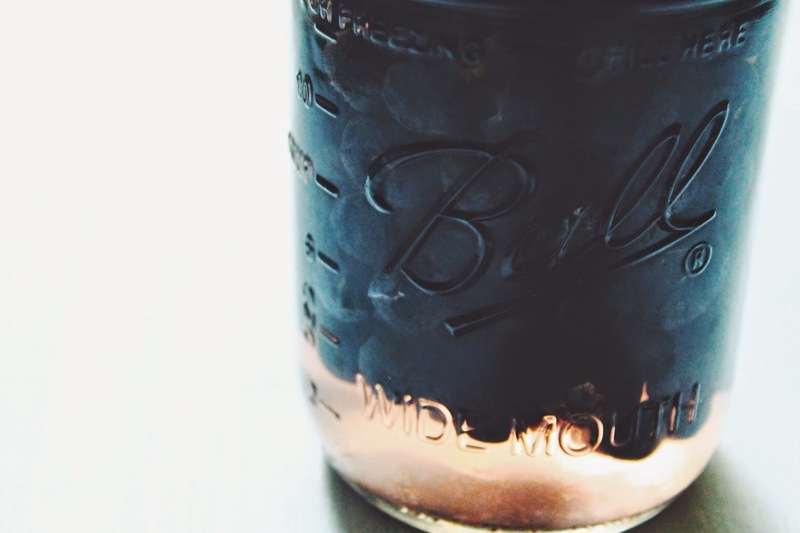 Their natural sweetness just sort of lends to a simple, sugary brine! Thanks so much for dropping by! P.S. - those polenta madeleines on your site look to die for! 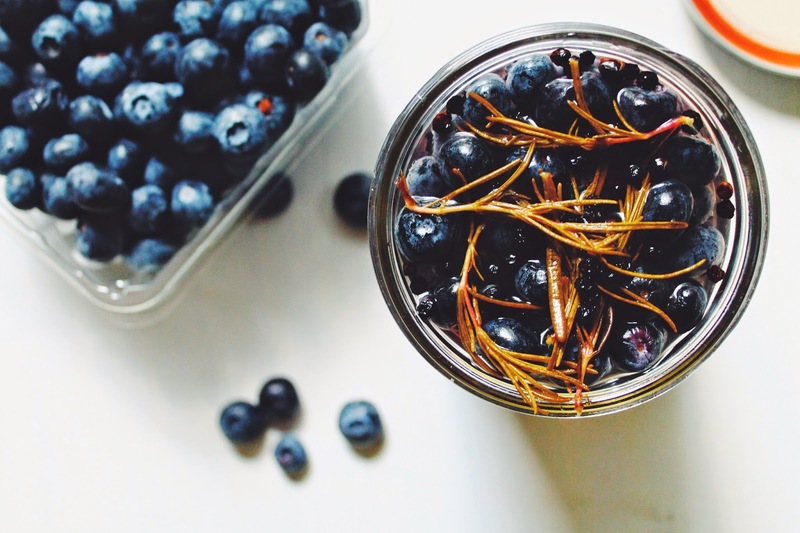 I love the idea of pickling fruit -- and how fun to use blueberries, which are in fact delicious with rosemary. :-) your pictures are beautiful!